Whiteside bits are made in many forms to handle your unique design. These plunging round over router bits were designed for those special jobs. Woodworking craftsmen will also be pleased to know that the point of this double fluted router bit also comes in an extended length version. 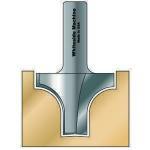 These Bearing Guided Round Over router bits are manufactured by the award-winning Whiteside Machine Company. 1/8" 3/8" 1-3/4" 1/4" 1/4" 1/8"
3/16" 5/8" 1-3/4" 1/2" 1/8" 1/4"
1/4" 3/4" 1-7/8" 1/4" 3/8" 1/4"
1/4" 3/4" 2" 1/2" 1/4" 1/4"
1/4" 3/4" 2" 1/2" 3/8" 1/4"
3/8" 1" 2-1/8" 1/4" 5/16" 1/4"
3/8" 1" 2-1/4" 1/4" 9/16" 1/4"
1/2" 1-3/8" 2-1/2" 1/2" 3/4" 3/8"
6/16" 1-5/8" 2-3/4" 1/2" 1" 1/2"
5/8" 1-3/4" 3" 1/2" 1-1/16" 1/2"
3/4" 2" 3" 1/2" 1-1/8" 1/2"